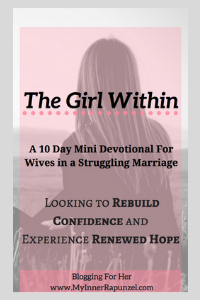 The Girl Within is a 10 Day Mini Devotional for the wife in search of renewed confidence and hope, created for those who've been through a marital storm such as infidelity. Whether newly married and struggling, separated and standing for marriage, or legally divorced, there is something for everyone in this E-book. Each day comes with an encouraging message, reflection exercises that encourage growth and healing, and supporting scriptures.